LEN - www.lankaenews.com | Gamarala and disciples bypass cabinet in corrupt Rs.20 billion tender ! Commanders duped; Is there a government at all ? 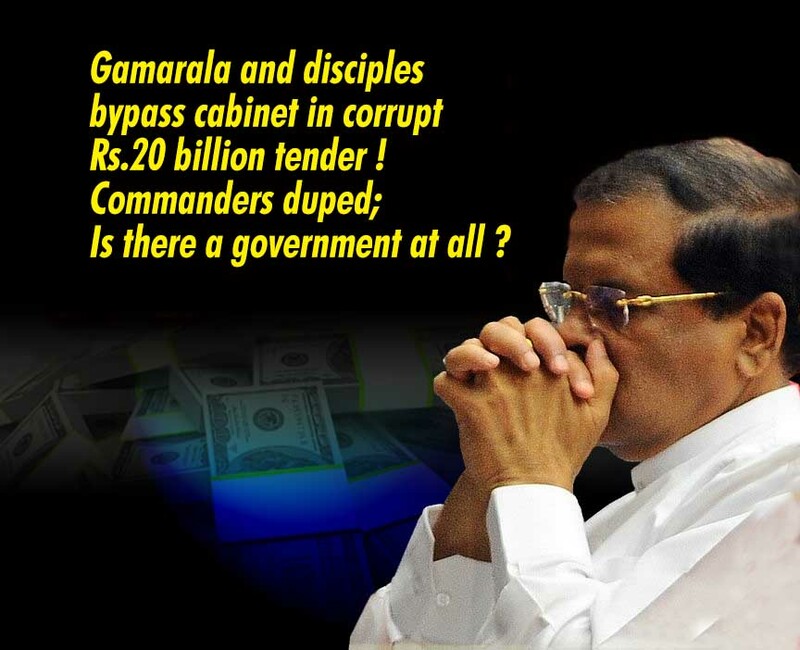 Gamarala and disciples bypass cabinet in corrupt Rs.20 billion tender ! Commanders duped; Is there a government at all ? 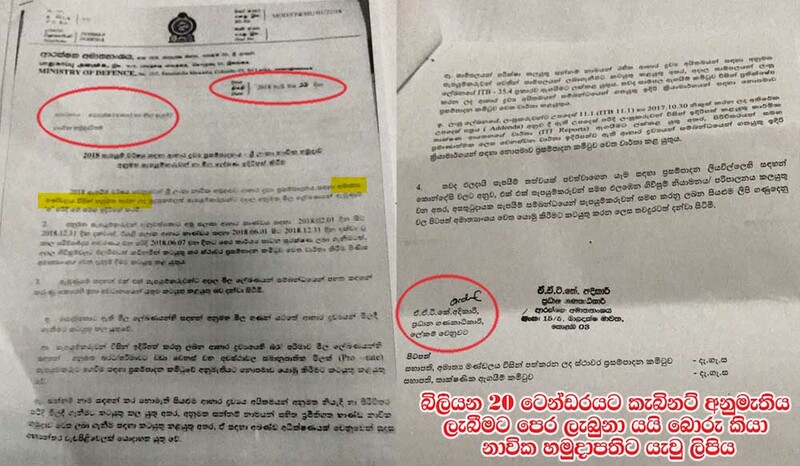 (Lanka-e-News- 01.June.2018, 11.30PM) The approval sought via the cabinet paper that was tabled on the 22nd by president Pallewatte Gamarala who is the defense minister pertaining to the corruption tainted Rs. 20 billion tender concerning the supply of food supplies to the three forces was not granted on the 22nd and postponed . However , now attempts are being made to get that passed through other illicit routes to the detriment of national interests . 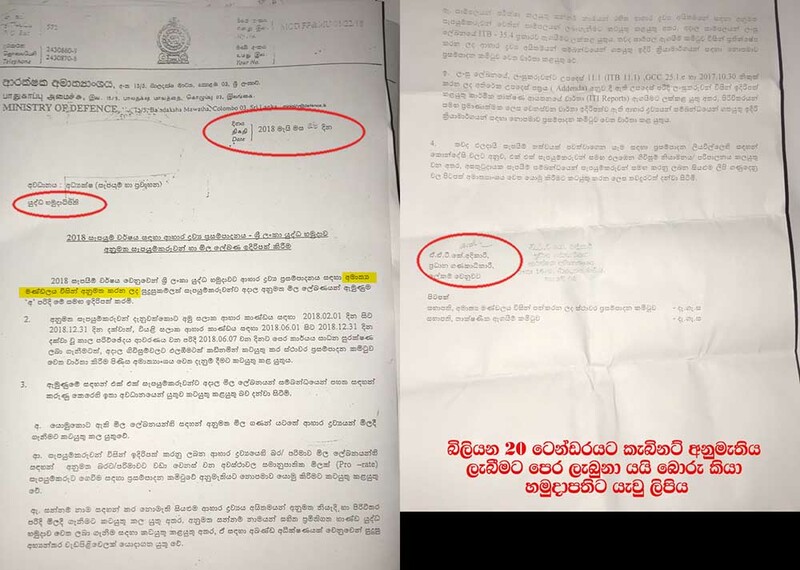 While the cabinet approval has not been granted , the defense ministry has sent letters dated 28th to the three commanders to register the supplier brazenly stating the approval has been obtained. Those letters have been signed by the chief accountant A.A.T .K.Adhikari on behalf of the defense ministry secretary. (The three letters are herein) . What is more rudely shocking is , even when this paper was being submitted to the cabinet on the 22nd , an investigation was in progress in regard to this corrupt tender at the FCID , the Bribery and Corruption Commission , and even the Auditor General was probing into this. Perhaps because of these investigations , the cabinet paper was tabled under the supplementary category , and not via the normal defense ministry procedure. The difference is , ordinarily when a cabinet paper is being tabled by a ministry , that has to be submitted to the ministers prior , and their observations obtained . The approval is given the following day after taking into account all the recommendations . A cabinet paper tabled under the supplementary category to the cabinet however is not on those lines. The paper is not presented to the ministers nor are their recommendations obtained . The next cabinet meeting was scheduled for the 29 th , but as that was a Poya day , the cabinet is to meet on the 30 th at 10.30 a.m. If the approval for this corrupt tender bid is to be granted , that will be on the 30 th. Treason against State ! Commanders duped ! Ministers struck by Rigor mortis even before they have turned into corpses ! 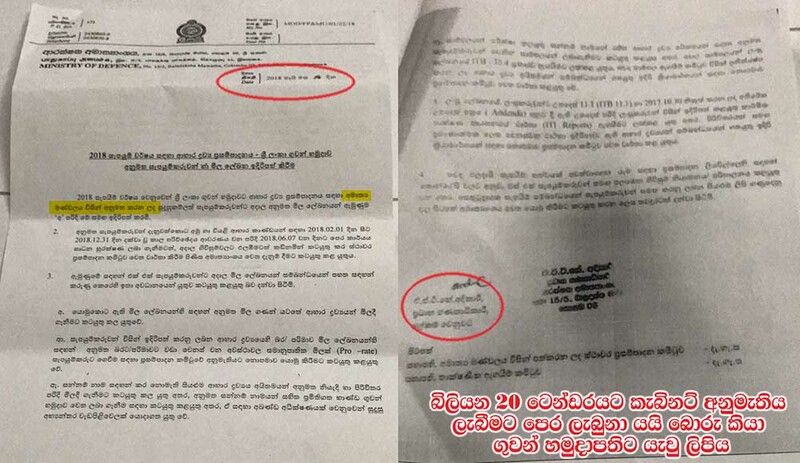 It is in these most corruption riddled circumstances , the accountant under the president’s defense ministry has most shockingly addressed three letters to the commanders of the forces on the 28 th stating the cabinet approval has been received . Under what laws has he acted in that manner? This is clearly a move against the State , and a deception practiced on the forces. Surely the accountant has acted most unlawfully and dangerously against the State with the full knowledge and consent of the defense secretary, and the latter is doing this with the knowledge and consent of President Gamarala and the cabinet secretary. It is clearly deducible from this even the appeal committee is corrupt, and the recommendation made regarding this Rs. 20 billion corrupt tender is to award it hurriedly to their henchmen. Based on reports reaching Lanka e News , G.S. Vitharnage who functioned as chairman of this Tender Board had revealed , if the cabinet approval is not received for this corruption tainted tender bid, he himself will be entangled in the investigations conducted by the FCID , Bribery and Corruption Commission, and Auditor General against this tender process . Hence the cabinet approval should somehow be obtained. If the bureaucrats can openly carry on saying cabinet approval has been obtained where it is not received, in such a country there cannot exist a government . If the bureaucrats can act this fearlessly , unlawfully and can enjoy such impunity , a government cannot exist there. If this is the sorry unlawful state of affairs in the country , it is for the so called ‘honorable’ ministers to tap their conscience and ask themselves ‘ are we in the cabinet to sniff our own excreta ?’ It is a pity the ‘honorable’ ministers who should be acting with honor in the national interests are afflicted with rigor mortis even while they are alive. Copies of the three illegal letters sent by the defense ministry are herein. President seeks cabinet approval for a Rs. 20 billion corrupt tender bid under investigation at FCID and Bribery Commission !